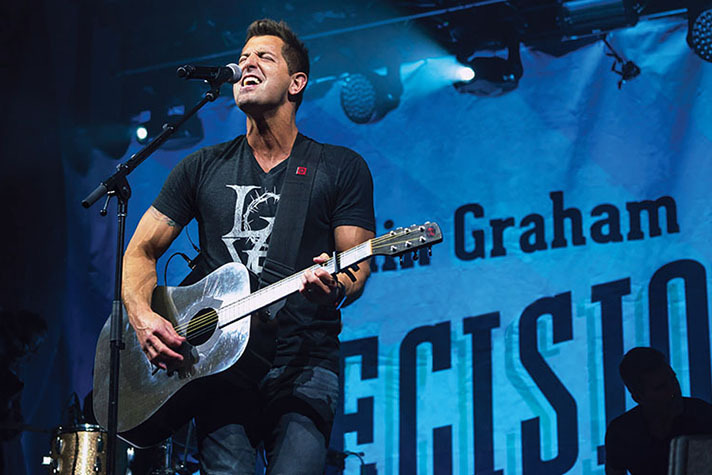 GRAMMY®-nominated singer, songwriter and storyteller Jeremy Camp has led worship and shared his testimony with thousands on the Decision America tour with Franklin Graham. I was startled when I went to a radio station for an interview while in Monroe, Washington, for the final stop of Franklin Graham’s Pacific Northwest Tour. One of the employees showed me an Instagram post from two years ago. As a friend of hers was taking her last breath, the family was being comforted by one of my songs, Walk by Faith. I had written the song during my honeymoon with my first wife, Melissa, who was battling cancer and would die just three months later. Well, You’ve spoken—pouring Your words of grace. That song was the last thing the woman’s friend heard before she went to be with Jesus. I was humbled. I don’t deserve any of this. It’s only by God’s grace I’m able to live—and sing—for Him. He deserves all the glory and all my thanks. When Melissa died at the age of 21 and I was 23, my faith was shaken to the core. I shouted to God, “I believed!” because Melissa and I did. We had prayed because we knew God could heal. Many Scriptures rushed into my mind, verses I had memorized growing up and in Bible college. One in particular ministered to me deeply and God applied it to my broken life. Proverbs 3:5-6 says: “Trust in the Lord with all your heart, And lean not on your own understanding; In all your ways acknowledge Him, And He shall direct your paths” (NKJV). >> Listen to Jeremy Camp’s story about loss and faithfulness. I told God, “OK, here’s my heart.” He didn’t take it and smash it on the ground. No, He took it and so delicately healed it. Two weeks after Melissa went home to be with the Lord in Heaven, God graciously enabled me to write I Still Believe. God’s Word is inerrant, it’s God-breathed and it’s absolute truth. I believe everything in it. Death is not final for the Christian because we serve a living God, who raised Jesus Christ from the dead after His crucifixion for our sins on the cross. What’s amazing, and this is all God, is that Melissa had such an eternal perspective. She had told me, “Jeremy, if I die from this cancer and one person gets to know Jesus as their Savior because of it, it will all be worth it.” Because this was not her home, she had His peace and joy. Well, 17 years later, there hasn’t been just one but tens upon tens of thousands of people who have heard about Christ and committed their lives to Him as I have shared my testimony in concerts around the world. Thank You, Jesus! And, of course, I’m so grateful God brought me a new wife, Adrienne Liesching. We have three beautiful children—Isabella, Arianne and Egan. Adrienne and I are looking to Him for wisdom and grace to rear our kids, knowing He is in control of their lives and that we can trust Him for them. My life Scripture is Acts 20:24: “But none of these things move me, nor do I count my life dear to myself, so that I may finish my race with joy, and the ministry which I received from the Lord Jesus, to testify to the gospel of the grace of God” (NKJV). I wish I could say I’ve conquered all of my fears. Like the Apostle Peter, I start to sink when I look at the huge waves. But when I look toward Him, He is always The Answer. Jesus is our Comforter, our Shield and Protector. He is our Wonderful Counselor, the Alpha and Omega—the Beginning and the End. He is the Great Shepherd and the Way, the Truth and the Life. He is all we need.